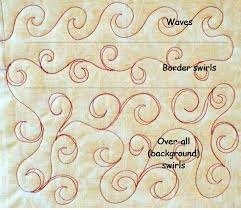 Overcome your free-motion fears and build confidence in your machine quilting. This two day course will take you through needles, threads, batting selection, sandwiching and more. Walking Foot? We'll show you. Darning Foot? Huh? We'll show you. You'll learn how to use these feet, how to quilt your own projects and feel proud in your work. 	Sewing machine, bobbins, sewing machine manual 	Neutral or cream thread (size 50) for bobbin 	Thread scissors 	Transparent plastic ruler 	Notebook and pen, paper and pencil 	Marking pencil 	Quilters safety pins 	Extension cord (if necessary) 	Walking foot to fit your machine 	Embroidery/darning foot to fit your machine 	1 spool cream machine quilting thread (size 30 or 40) Sulky or rayon 	1 spool metallic thread, plain or variegated (optional) 	1 spool machine quilting thread (size 30 or 40, plain or variegated) any colour you like 	Embroidery, quilting or topstitching needles (size 14) 	Twin needle (size 2.0, 2.5 or 3.0) 	Lunch 	10 muslin squares 14" x 14" 	5 batting squares 14" x 14" 	4 muslin squares 8" x 8"		2 batting squares 8" x 8" PLEASE NOTE: 	For best results, use 100% cotton batting or cotton/poly batting (e.g. Hobbs Heirloom). Polyester Batting is difficult to machine quilt. 	It is a good idea to take your sewing machine with you when purchasing your darning and walking foot to be sure of a proper fit.